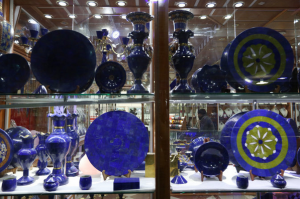 Some of the finest lapis lazuli comes from Afghanistan. This was true in the early modern period when European artists wanted an exquisite blue for painting the Virgin Mary’s cloak, and it continues to be valued by artists and collectors today. 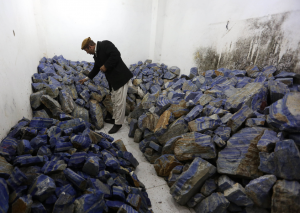 The mining of this gemstone and mineral in Afghanistan today, as well as buying objects made from Afghan lapis lazuli, is not straightforward, as this article from The New York Times points out. This entry was posted in Art and war, ARTH 114, ARTH 115, Materials on June 7, 2016 by admin. I recall talking about Lapis Lazuli in class recently, and how it was used for color in busts, and used in dyes and such. I had never really thought much of the stone and that common shade of cobalt blue until I saw the way it was incorporated into these vivid and intricate works of art. It is sad that lack of over site lead to no protection and the loss of his mine. It is even worse that the government does not care that it is funding the Taliban by not protecting the mine owner. None the less the beauty of the stone is incredible. Its dye is just incredibly blue. It is incredible that this design resource has maintained such a reputation over hundreds of years. It’s too bad that a group like the Taliban is benefiting in revenue from this beautiful resource. With no security for the mine owner, this endangers the business and thus makes me wonder where it would go if the state began to control all mining endeavors of the precious stone. The political turmoil around lapis lazuli in recent years is an incredible, though unfortunate, testament to the power natural resources have in shaping history and social climate. lapis lazuli has affected the economy and trade relations in the territory of modern-day Afghanistan since ancient times. The precious gemstone has been prized and used in art objects as old as the Standard of Ur ca. 2600 – 2500 BCE from Early Mesopotamia, and the Ishtar Gate ca. 575 BCE from Babylon. The brilliant blue that drives demand for the gemstone lends it its economic value. That value, combined with the price paid in labor, violence, and political upheaval, demonstrates the importance of the symbolic capacity of color to the human experience.